Electrical power transmission generally deals with very high voltages as a bulk amount of electrical energy has to be transmitted from generating stations to load centers. At this much high voltages, an effect called as corona effect is introduced. As this corona effect results in loss of electrical energy, it is also called as corona discharge. Have you ever heard a hissing noise when standing below a high voltage transmission line? That hissing noise is due to the corona discharge. 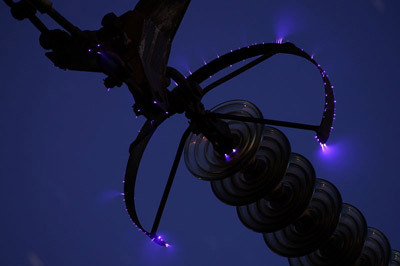 Corona discharge is usually accompanied by a hissing or cracking audible noise, visual violet glow, production of ozone gas around the conductor, power loss and radio interference. When a potential difference is applied between two conductors, a potential gradient (or electric field) is set up in the air. This potential gradient is maximum at the surfaces of the conductors. Under the influence of this potential gradient, existing free electrons in the air acquire greater velocities. Some free electrons are always present in the air due to cosmic rays, UV radiations etc.. Greater the applied voltage, greater the potential gradient and, hence, greater the velocity of free electrons. When the potential gradient at conductor surfaces is large enough (about 30 kV/cm), existing free electrons strike neutral air molecules with enough velocity to dislodge one or more electrons from it. Hence, cumulative ionization of the air near the conductor surfaces occurs. Ionized air is partially conductive. Electric discharge occurs due to the ionized air which results in corona. And if the conductors are close enough to each other, the air insulation breaks down and electric discharge occurs through a spark. The minimum phase-neutral voltage at which corona starts to occur is called as critical disruptive voltage. And, the minimum phase-neutral voltage at which visual corona glow appears all along the conductors is called as visual critical voltage. Atmosphere: As it is already explained that the corona forms due to ionization of the air. There are always some free electrons in the air (which means air is pre-ionized to a little extent). However, in stormy weather, the number of free electrons is more than that in normal conditions. In such case, corona occurs at much lesser voltage. Conductor size: Corona discharge also depends on the shape and size of the conductors. Irregularities on the conductor surface concentrate the electric field at locations, resulting in corona at these spots. Thus, a stranded conductor gives rise to more corona than a solid conductor with a smooth surface. Also, conductors having large diameter have lower electric field gradient at the surface. Hence, conductors having large diameter produce lower corona than small-diameter conductors. Spacing between the conductors: Larger distance between the conductors reduces the electric stresses between them. And, hence, larger the distance between conductors, lesser the corona formation. Line voltage: As it is already explained, lesser the line voltage, lesser the ionization of surrounding air. Corona discharge starts to occur when the voltage becomes greater than a minimum critical voltage called as critical disruptive voltage. How to reduce the corona discharge? By increasing the conductor size: As explained above, larger the diameter of the conductor, lesser the corona discharge. By increasing the distance between conductors: Larger the conductor spacing, lesser the corona. Using bundled conductors: Using a bundled conductor increases the effective diameter of the conductor. This results in reduction of the corona discharge. Using corona rings: The electric field is greater where the conductor curvature is sharp. Therefore, corona discharge occurs first at the sharp points, edges and corners. To mitigate this, corona rings are employed at the terminals of very high voltage equipments such as at the bushings of a very high voltage transformer (Corona discharge also occurs in high voltage equipment). A corona ring is electrically connected to the high voltage conductor, encircling the points where corona discharge may occur. This significantly reduces the potential gradient at the surface of the conductor, as the ring distributes the charge across a wider area due to its smooth round shape.